Mid-Term Elections 🇺🇸 Burbank Police Foundation. 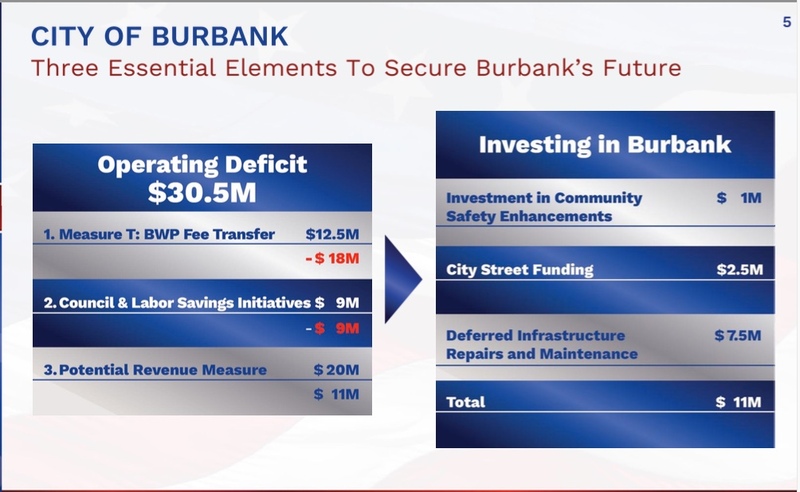 Just months after pleading with Voters to Pass Measure T: “To maintain essential City services/infrastructure like police, fire, parks, libraries…”, Burbank wants to increase our Sales Tax by a massive 0.75¢ to 10.25¢, to essentially do the exact same thing. An honest Ballot statement would read: “To pay for our Unfunded Pensions because previous Council’s took a Pension Holiday (now Illegal) and did not contribute what they should have for 6 consecutive years; and our highly paid City Staff Salaries + generous Benefits; future Infrastructure Maintenance needs because we don’t make Developers Pay their Fair Share in Fees; shall Burbank Taxpayers Bailout the City (again), even though we just passed Measure T, by raising our Sales Tax 0.75¢ Forever (no Sunset), giving Burbank the dubious honor of having the Co-Highest Sales Tax in the USA”? The City has basically cut-&-paste their Ballot language from Measure T and will no doubt engage in a similar “fear-based” campaign threatening Service Cuts if this massive Sales Tax Hike doesn’t pass. What about Pay Cuts? What about Living Within Your Means like the rest of us? What about getting back to focusing on providing the best Municipal & Public Safety Services instead of wasting time on non-essentials like banning Columbus Day! There’s so much the City can/should do before raising TAXES. 1. City Mgr Ron Davis mentioned $2M in potential savings during Budget discussions via Workers Comp changes & Outsourcing certain new positions where it makes sense (IT?). 2. Raise Development Impact Fees to match Glendale/Pasadena to pay for future infrastructure needs (they charge $18k/unit vs $2k). 3. Re-Negotiate Public Service Employee Union contracts requiring all workers contribute 50/50 towards PERS, not just new employees. 4. Remove Per Employee Biz Tax Caps that give large Employers tax breaks on the minuscule $10/employee they’re suppose to pay vs Gross Receipts other Cities charge. 5. Pay Cuts: 10% for 414 Employees $150k+ & 5% for another 284 Employees making $100-$150k. 6. Close the 1 Wall Remodeling loophole costing us Tax revenue 7. Divest of Assets that are draining City resources like Starlight Bowl, Golf Course, Colony Theatre or explore Public/Pvte. Partnerships, Naming Rights etc. 8. Get Back-to-Basics & focus on providing Municipal Services & Public Safety not Wish-List & Pet-Projects until revenue increases. 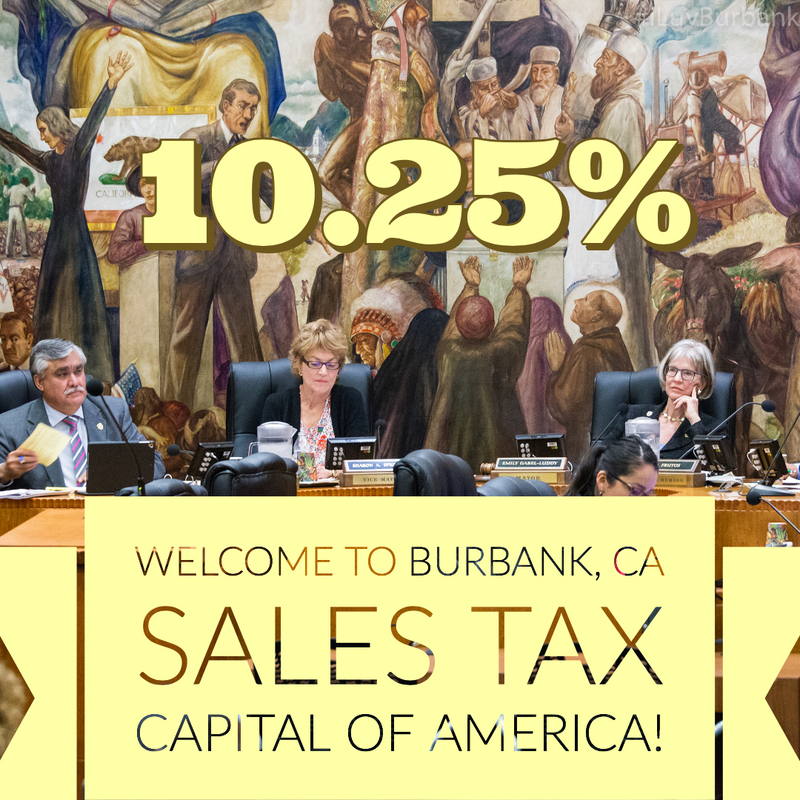 Then, after you’ve Cut Costs & Re-Focussed on Essential City Services, come back to the Voters for a Temp 0.25¢ Sales Tax increase with a 3-5 year Sunset clause IF NEEDED, & I’m sure the good people of Burbank would be willing to help out. This $20M Measure is 2x what the City actually needs to balance future Budget deficits, creating an $11M annual Cash Pot. It’s also Bad For Business, esp. those selling higher-ticket items. It takes a just a few minutes more to drive to L.A. for Appliances, Cameras, Computers/Electronics, Cars etc. Local Business are being hit with a double-whammy with the proposed 10¢/sqft BUSD Parcel TAX, meaning additional Taxes or pass-through Rent increases on top of what some have already endured in Magnolia Park. Big Corporations like Ikea & Walmart can afford to absorb the costs, but small Mom-&-Pop stores are going to be hit esp. hard if these new Taxes pass & some will probably go out-of-business. 2. Review the Salaries + Benefits our City Employees’ are being paid. 3. Compare our Salary + Benefits Costs that account for 80% of the Budget with Glendale (approx $985 vs. $1176 per employee per resident or 20% more). I love Burbank and want to see our City prosper, but this Taxpayer Bailout only encourages More Spending & Waste. I urge my fellow Burbank residents to Vote NO in November and send our elected Leaders a loud message: Trim The Fat, Cut Spending & Live Within Your Means!